This lecture will help you to successfully implement image masking in C# using the Ozeki Camera SDK. After reading through this guide you will be able to select an area of interest on captured video frames with a bitmap image. To start, OZEKI Camera SDK has to be installed and a reference to OzekiSDK.dll has to be added to your Visual Studio project. Important: you should study this article in order to find out how to set up your Windows Forms Application correctly. The image masking function can be an effective help if you wish obtain the security footings of your business location or even home and analyse it on a very specified area. 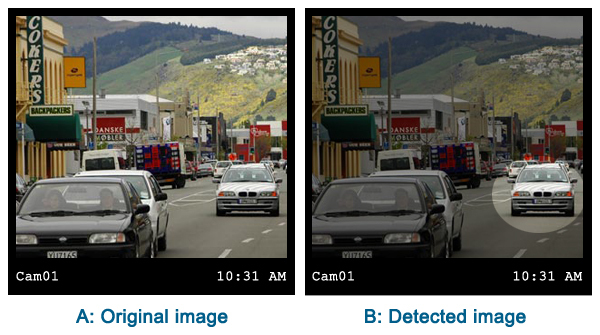 The image masking function can be useful in the case of surveillance systems and image analysis. If you wish to analyse a very specific area of the captured image the image masking function is the ideal solution for you. For example, you can analyse the traffic of your shop or business. The image masking function can be used in the fields of identification and authentication. Moreover, the image masking function of the Ozeki Camera SDK is the best option for you if you wish to analyse a specific area of a picture. For example you can focus on one car on a picture which was taken by your security camera. Mask: It is an enum value which helps us to determine which part of the masked image should appear in the video. Foreground: In this case the mask image is translucent, the other parts of the image which are not covered will be black. MaskImage: An Image file which helps us to set the mask image and we can also get the actual mask image by using it. The extension of a MaskImage image file which must be in .png format because only this allows the transparency. In case of other extensions, the video image will be exposed. The Ozeki Camera SDK configures the resolution of the set mask image equal to the resolution of the video and after this, the mask image will be applied to the video. In this way, the resolution of the mask image is not important. Empty constructor - In this case there is no configured mask image. String file - In this case the path of the mask image which you wish to display should be provided as a parameter. By calling the Start() method the set mask image appears. By calling the Stop() method we can stop the displaying of the mask image. By reading through this lecture you can find an example and implementation for image masking in C# using the Ozeki Camera SDK software. After examinig this guide you will be fully familiar with the subject of selecting an area of interest on captured video frames with a bitmap image. What are the minimum and maximum aperture sizes? The minimum aperture size is 1x1 and the maximum aperture size is the maximum size of the picture. What is the original image? Any image which can be found in your image collection before any transformations are applied is an original image.